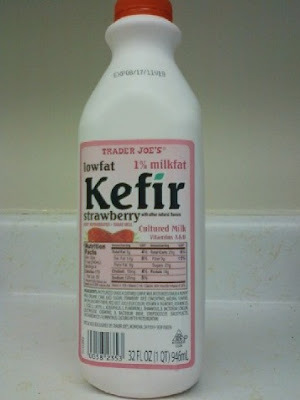 "Kefir" is actually pronounced "Keh-FEAR," although so many people use the popular mispronunciation "KEY-fur," that it may soon be an officially accepted pronunciation. I wanted to say "Keffer" like it rhymed with "heifer," probably because I subconsciously associated yogurt with milk and milk with cows. "What is Kefir?" you might ask. Well, up to this point, I've always thought of it as "drinkable yogurt." Trader Joe's version, however, declares itself "cultured milk." From a marketing standpoint, I'm going to go ahead and say that "drinkable yogurt" is probably the better way to think of this stuff. Let's face it, we've all left a half-gallon of milk in the fridge a week or so too long before...and, well, wouldn't that be "cultured milk" as well? I'm no dairy scientist, but isn't rancid milk essentially just milk that's been "culturing" a little too long? I guess this particular milk has been cultured with a unique strain of helpful probiotic bacteria and not the nasty little fellows that have raucous parties in our month-old milk cartons. When you drink this Kefir, you can feel a tingling sensation on your tongue. I picture thousands of little one-celled characters square-dancing in the bottle and subsequently in my mouth and tummy. They're all wearing red and white plaid, which appears as pink to us, since we're watching the spectacle from a distance. I don't know how they get the strawberry flavoring in there. I guess they just add the strawberry juice after the little square-dancing buggers have had their way with the milk. I'm not sure what deal they've worked out with the microorganisms to keep them from eating the strawberry flavors. I would think that after eating so much cream, the little guys would want some fruit. At this point in the blog post, I'm quite certain I've lost all of the microbiologists and dairy science people, as they are no doubt disgusted by my ignorance of all things miniscule and microbial. It's probably quite pretentious to assume that any educated people are reading this at all and are putting up with my nonsensical anthropomorphism and talk of square-dancing probiotic organisms. No one except perhaps a few stragglers hoping to have a laugh at my expense...and possibly one or two who are interested in whether or not I enjoyed the product...in which case I should end this pointless tangent immediately. I'll just go ahead and say this is very normal, average Kefir. I liked it. They didn't reinvent the wheel with this one. It's exactly what I expected. No more, no less. Smooth, creamy, strawberry-tasting. But since we know TJ's is capable of going above and beyond and doing so much more than their competition, simply meeting our expectations won't get this product anywhere close to Pantheon status. It's a 3.5 in my book. Good for digestion. A half-glass is a filling between-meal snack. No big complaints, but don't expect more than you'll get from any other brand. Sonia gives it a 3. She thinks it's OK, and she knows it's good for her, but she's not a big fan of Kefir in general. She thinks all Kefir has a funny aftertaste, including this brand. I love kefir yogurt as well. In fact, I have stocks of it inside my fridge. I always have it whenever I feel bloated and constipated. How funny, I just bought some today for the first time along with fresh strawberries and bananas. I used a blender and added just the strawberry Kefir, fresh strawberries and a banana. It's really good. Latta Kefir just released a new Strawberry flavor. I actually like it better than Trader Joe's Strawberry.